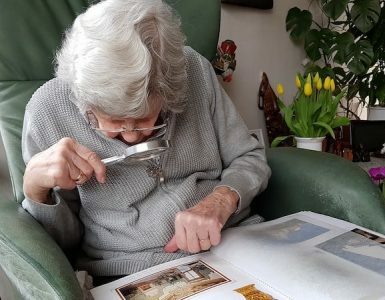 When it comes to people with disabilities or the elderly, taking a bath is one of the more daunting tasks of daily life that is also fraught with many risks. This where handicap shower chairs come in handy as they help them overcome this challenge. While taking a bath is indeed not a concern for people without disabilities, the bathroom is a very dangerous and risky place for people with mobility issues such as the people with disabilities and elderly. There are several cases of people being injured in the bathroom every year. In addition, Seniors and people with disabilities find it a challenge to stand and shower for minutes due to their weakened bodies. Choosing the best handicap shower chair helps overcome these problems without spending hefty amounts of money. However, finding the right shower chairs for handicapped can be a considerable challenge. Thus, we have prepared this article to help you get a good value for your money. What Is Handicap Shower Chair? Handicap shower chair is a lightweight stool that is designed with a backrest and two armrests to provide additional support and protection to people with mobility issues such as the disabled and elderly while bathing. It helps reduce the risk of falling or slipping in the bathroom, which could even lead to serious injuries. Therefore, it makes taking a shower or bath delightful and safe while also allowing people with disabilities lead a more independent life. You may also want to consider a shower transfer bench. The best handicap shower chairs are aesthetic, rustproof and most importantly feature slip-resistant and comfortable designs that offer wonderful experience to users. Besides, they should also come with sturdy construction that allows them to withstand pressure or support a lot of weight, especially from disabled adults. As mentioned above, when it comes to finding shower chairs for the elderly, there are a high number of options available in the market with a variety of sizes and shapes. Therefore, choosing the right one can be a daunting task, especially if you decide to do it yourself. Vive’s Shower Chair with back is our top pick for the best handicapped shower for elderly and disabled. The bath chair is highly adjustable, which makes it an excellent alternative to those who find shower benches not secure enough. Therefore, it remains one of the most popular shower chairs for elderly available today. Finally, it fits more perfectly in medium or average size bathroom as compared to most of the top rated products in this category. It also features no foldable design but it easy to store and comfortable for most users. 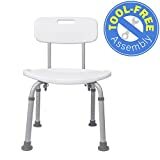 If you want a shower bench for elderly with a removable back that is hassle-free to assemble, then Medical Adjustable chair is a perfect option for you. The product features an aluminum frame that offers an impressive weight capacity of up to 300 pounds. 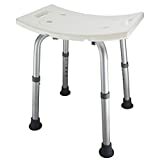 Medical Adjustable Bath Bench comes with skid-proof rubber caps that allows for even distribution of weight for excellent safety. Besides, the shower bench for elderly is uniquely designed with an extensive and contoured polyethylene seat that is durable, comfortable and has anti-bacterial properties. It also features built-in handles for extra safety and comfort and also includes drainage holes to prevent it from slipping out of place. The chair is also highly customizable as it provides optional back support and legs with adjustable height. NOVA Medical shower chairs are one of the top rated products in the industry. The bath chair is specially designed with waterproof materials, which makes it an ideal product for bathrooms. It also features a great design with padded armrests and backrest to reduce the risk of the people with mobility issues slipping or falling. Besides, the padded armrests and backrest enhance personal comfort. The shower chair comes with a sturdy construction that entirely consists of the lightweight aluminum frame. On the hand, the legs are covered with plastic caps that prevent them from moving out of position. With its lightweight structure and a sturdy frame, the seat is more durable than most of the shower chairs available on the market. 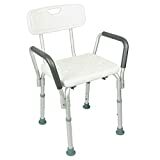 Dr. Kay’s Adjustable Height Shower and Bath Chair is one of the top rated products in the industry. The bath shower chair comes with great features and design that makes it one of the top-rated bathroom stools on the market today. Therefore, if you want to avoid sacrificing personal comfort and safety when bathing or showering, then this is an excellent option for you. The shower chair for elderly features a sturdy construction that makes it incredibly durable while allowing it to support a lot of weight. This is one of the most important features that enable it to be considered among the best shower benches. With its lightweight design, the bath stool is ideal for travelers. Finally, it comes with non-slip feet and platform, and side handles for extra support and enhanced safety. Besides, the shower chair has an adjustable height (between 12.5-18.5 inches), which makes it suitable for a wide variety of users. If you want to upgrade from standard products, the Ez2care shower chair is the right stool to consider. The bath chair is also relatively affordable, adjustable and lightweight, which makes it one of the most accessible and convenient bathtub chairs. Therefore, this shower bench is an excellent alternative to Dr. Kay’s shower chair, especially when it comes to bathtubs. Ez2care features a fabulous construction with a fantastic finish, which makes it corrosion resistant while allowing it to support up to 250 pounds. 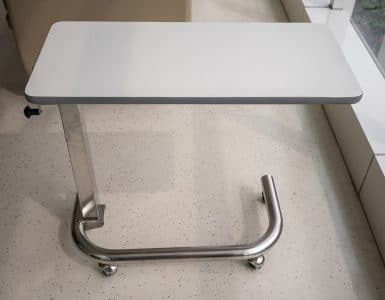 The bath chair’s structure is a combination of curved seat and lightweight aluminum frame making the stool more comfortable than other products in its category. Moreover, the shower bench comes with rubber-covered legs to prevent it slipping out from its position, as this would be risky. Medokare Round Shower Stool is a comfortably padded bath stool, which makes it a great shower chair for handicapped. This padded shower stool is easy to clean, as it is detachable. 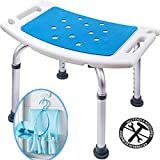 Moreover, the bath stool is designed with drainage holes to allow water to drain and has anti-slip feet with rubber caps. This explains why it is among the best handicap shower chairs on our list. The Chair is also easy to assemble, as it does not require any special tools or skills. Moreover, it is molded from high-quality anodized aluminum that is rustproof and corrosion resistant. The bath stool is height adjustable making it ideal for both short and tall adults. Therefore, you will be able to adjust its height to suit your needs. Taking a shower or a bath exposes the elderly to risks such as falling or slipping, which can lead to severe accidents. 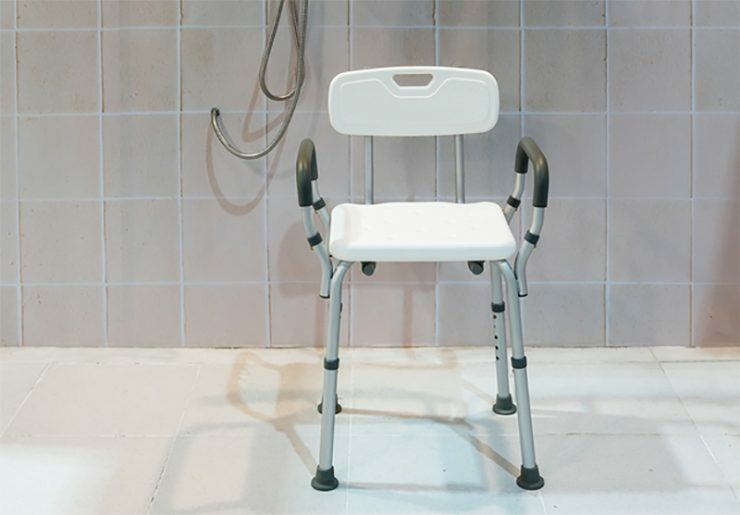 Most shower chairs are made of aluminum frame to provide enough support to seniors whenever bathing and have rubber pads to prevent slipping. Besides, these chairs are curved inwards like a bench or large and square shaped backrest and armrests for extra comfort and support. With these features, the shower bench for elderly will allow the elderly bath with no risks of injuries. People using a shower bench for the elderly find it easier to get access to the bathrooms. This is due to the more compact design of shower chairs as compared to other security aids like wheelchairs. 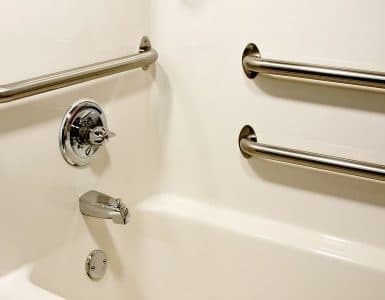 Furthermore, some of the best handicap shower chairs have a sliding bench to enable the elderly or people with disabilities to allow for a smooth transfer to the bathroom. Most of the top-rated shower chairs are not expensive, which means there is no compelling reason why the elderly should not buy one. Besides, the alternatives to bath chairs are either risky or more expensive than these benches. One of the most important things to check out is the quality of the assembly. It is advisable to buy a product with a premium quality construction. These include shower chairs that are made of rustproof aluminum frame and durable plastic as they offer extra support. It is important to consider a portable shower chair if you will require carrying it to and from the bathroom often. Fortunately, some of the best shower chairs come with dismantled feature and adjustable facility. The other important factor to look at is how much weight the chair can hold. Most of the top-rated bathtub seats can support up to 300 to 350 pounds of weight. A bathroom is a risky and dangerous area for the elderly due to their mobility issues and the slippery nature of the place. The right shower chair should have non-slip seats, safety belts, built-in handles, padding, non-slip feet, high visibility colors and drainage holes. It is also advisable to consider the size of the chair as compared to the space available in the bathroom. Therefore, you should choose a bathtub seat that fits perfectly in your bathroom. The right shower chair should be easy to install and without the use of any special tools or skills. Thus, you should avoid products that are hard to install. Overall, choosing the best handicap shower chairs is both time consuming and a considerable challenge, especially when you do not understand what to consider. However, we believe that the best 6 products on our list will help you find the right bath chair for your beloved one. If you get the ideal chair on our list, go for it, but if you are not happy with our picks for one reason or another, you can use the information above to search for high-quality products. Last update on 2019-04-24 at 03:45 / Affiliate links / Images from Amazon Product Advertising API. Nothing on this site should be construed as medical advice. This website is for informational purposes only. Mobilitywithlove.com is a participant in the Amazon Services LLC Associates Program, an affiliate advertising program designed to provide a means for us to earn fees by linking to Amazon.com, Amazon.ca, Amazon.co.uk and affiliated sites. Amazon and the Amazon logo are trademarks of Amazon.com, Inc, or its affiliates.